The severe congestion, shortage of parking, and multiple mobility modes are some of the challenges big urban cities face today. Cities are now looking for new solutions and technologies to drive innovation across the city’s public transportation under aegis of smart city initiatives. A smart city drives more innovation that attracts business and talent, which drives the city’s economy. Most of tier 1 and tier 2 cities in the world have set aggressive goals to create smart infrastructure leveraging technology to track assets, drive collaboration, optimize resources, and reduce waste to provide better, more efficient and more affordable services to the community. Smart city initiatives are driving collaboration between government, enterprise, academia and service providers, mandating data sharing practices and adopting open platforms to drive innovation. The public transportation is the fabric of the smart city because of its mobile nature. To create a smart infrastructure, cities must rely on public transportation as a reliable source of information that is readily available. The smart infrastructure starts with connectivity. Investing in Internet of Things (IoT) technologies to connect assets, monitor their condition and gather actionable data will allow cities to make better decisions quicker. Furthermore, the actions can be implemented cost effectively and measure benefits to the community in real time. Smart cities will have smart transportation that will solve the different community challenges such as traffic and parking and high demand for commuting services. Those services will need to work for the city, the commuters, and the environment, providing accurate information of journey and transportation modes, affordability and convenience to users. This includes first mile/last mile, reduction of carbon emissions, paratransit services and more. Having the right future-proof technology in place is paramount to help transportation operators fulfill their current and future needs without having to upgrade frequently. Connectivity is fundamental building block of smart infrastructure and turns assets into live data sources enabling new and exciting use cases. While current vehicle onboard systems support monitoring the condition of the vehicle subsystems and alerting the driver, the information resides onboard and has limited use. When connectivity is put in place data can be sent to back-end systems, or a central office, and made available to other applications increasing the value of the data through this integration. For instance, in transportation a vehicle’s subsystems (like engine status, fuel economy or battery performance) will notify operation centers of anomalies in order to take action. New sensors can also be installed onboard the vehicle to inform the city of anomalies identified on the road converting vehicles into data gathering platform. 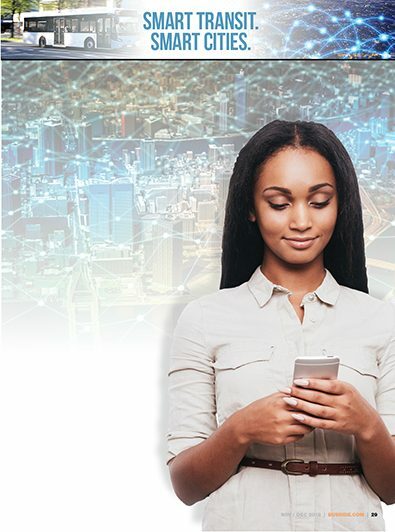 Smart cities leverage connectivity of things and people through real-time information from personal devices and applications as a way to gain a better understanding of transportation mode and time preferences, transportation behavior and preferred services. Connectivity onboard vehicles, buses and trains and around the city, 1) provides seamless connectivity to the community and 2) helps the city stay more informed and connected with the people. LILEE Systems’ IoT connectivity platform enables intelligent transportation systems (ITS) in transportation, enabling fleets to become connected vehicles with the opportunity to play a key role in the broader reality of the smart city ecosystem. Our expertise and capabilities rely on the development and deployment of key technology that enables smart connectivity onboard trains, metros and buses in a way that increases operational efficiency and reduces the total cost of owning the technology for operational, safety and passenger solutions onboard. LILEE specializes in providing mobile connectivity solutions for rail and buses to enable robust passenger Wi-Fi and operational and safety systems, and simplify the onboard network design through consolidation. With LILEE’s smart transportation platform, operators own future-proof technology that allow them to start and support their path to innovation in a way that simplifies their operation, optimizes resources, and integrates their existing and future onboard systems with technology that will help them control data transmission cost (i.e. LTE-A, 5G). optimize onboard camera and sensor data with a smart edge platform. When adopting new ITS technology as part their path to innovation, operators must learn what modern technology is available and deploy pilot tests before starting a formal bid process. When evaluating technology, don’t limit the solution to solving today’s needs; plan for the future as well. Technology projects should not be thought of in silos; the same technology can bring benefits to different groups in the organization and end users. Finally, operators must invest in technology that gives them detailed data for better informed decisions, and invest in understanding how to extract the most value from information available from multiple systems. Also, put systems in place to continuously evaluate and improve ROI and benefits. As cities begin to innovate, technology for transportation continues to advance. Major future developments include 5G, machine learning and artificial intelligence (AI). The transportation industry is now converging mindsets towards mobility-as-a-service and the introduction of electric buses. 5G could radically change how things are connected and how things interact with each other. Machine learning and AI help process big data, moving towards autonomous vehicles or driver-less vehicles. Thanks to technology and connectivity, mobility-as-a-service is leveraging and seamlessly integrating multiple and new modes of transportation, including traditional public transit and newer offerings such as ride-sharing and more eco-friendly vehicles, to match supply and demand transportation problems (including first mile/last mile and personalized transportation services). Electrification of vehicles, that is becoming a reality already in many cities around the world, gives OEMs the opportunity to equip vehicles with newer sensors and technology for safety and data gathering. Smart cities must work with public transport operators to define how to begin their innovation path that will bring benefits to the community and solve some of the biggest challenges faced today in transportation. Partnering with companies that are continuously incorporating emerging technology for transportation help cities start and move forward towards the future: smart city, smart transportation. Paola Realpozo services as director of rail strategy for LILEE Systems. Visit www.lileesystems.com for more information. North American transit attracts offshore OEMs. Why?